Objectives To update a previous systematic review assessing the efficacy of conventional synthetic disease-modifying antirheumatic drugs (csDMARDs) in rheumatoid arthritis (RA). Methods Two systematic reviews of the literature using PubMed, Embase and the Cochrane library were performed from 2009 until January 2013 to assess the efficacy of csDMARDs (as monotherapy or combination therapy) in adults with RA, and the efficacy of glucocorticoids in early RA. A third systematic review was performed until March 2013 to assess the efficacy of tofacitinib by meta-analysis. Results For glucocorticoids, of 222 hits, five publications relating to four new trials were analysed for efficacy, confirming that initial treatment of RA with low-dose prednisone plus methotrexate (MTX) results in better clinical and structural outcomes at 1 and 2 years than treatment with MTX alone. For csDMARDs, of 498 studies, only two new studies were randomised controlled trials comparing MTX monotherapy with MTX in combination with another csDMARD without differences in glucocorticoid usage. Using tight control principles, clinical outcomes were no better with immediate triple therapy than with ‘step-up’ therapy. For tofacitinib, the pooled analysis of 10 trials showed that tofacitinib was more efficacious on signs and symptoms, disability and appeared to be more efficacious on structural damage than control treatment with placebo (OR (95% CI)—American College of Rheumatology 20% (ACR20) response: 2.44 (1.97 to 3.02)) or treatment with MTX (ACR20 response: 2.38 (1.66 to 3.43)). Conclusions Addition of low-dose glucocorticoids to csDMARD therapy produces benefits in early RA. Under tight control conditions, combination therapy with csDMARDs is no better than MTX monotherapy. Tofacitinib is a new DMARD with proven efficacy. The four main research questions pertained to the efficacy on signs and symptoms, disability and joint damage. Topics considered were (1) the addition of GCs to csDMARDs in early RA; (2) methotrexate (MTX) as monotherapy versus its combination with other csDMARDs (disregarding the addition of biological agents discussed elsewhere)6; (3) individual csDMARDs and (4) tofacitinib, a new tsDMARD specifically targeted at inhibition of Janus kinases. Safety concerns were examined in a separate SLR.7 Tapering strategies for GCs were not dealt with in this SLR. Guidelines for SLRs were followed and are detailed in the online supplementary material. Efficacy was assessed by the change in signs and symptoms and disability status between baseline and week 24, week 52 and week 104, when available, and by the change in radiographic joint damage between baseline and week 52 and week 104. In each trial the effect size or the standardised response mean for continuous measures and ORs for dichotomous measures were determined to assess the magnitude of the treatment effect. Where possible, pooled effect size, pooled standardised response mean and pooled OR were calculated by meta-analysis, using the inverse of variance method. RevMan V.5.2 (Review Manager, Copenhagen, The Nordic Cochrane Centre, The Cochrane Collaboration, 2012) statistical software was used. Statistical heterogeneity was tested by Q test and I2 test. All meta-analyses were carried out using random-effects models in cases of statistical heterogeneity. Initially, 498 potentially relevant articles were screened by their abstracts. Two new studies were RCTs comparing MTX monotherapy with MTX in combination with another csDMARD, without differences in GC usage between the arms, in adult RA (selection process shown in online supplementary figure B). Twenty-five studies were analysed. No new data conflicting with the previous conclusions were found. Several RCTs confirmed the efficacy of MTX as both first and second DMARD.19–24 Only one RCT included leflunomide: it compared MTX and leflunomide in 368 patients with early RA. Of the 240 subjects who were randomised and treated, 129 received leflunomide and 111 received MTX. This study showed that MTX was better than leflunomide for the four primary clinical efficacy endpoints (tender joint count, swollen joint count, physician and patient global assessment score). The difference was not statistically significant for the three secondary clinical efficacy endpoints (morning stiffness, pain intensity, HAQ).25 Very few studies confirmed the efficacy of sulfasalazine.26 ,27 The studies analysed did not provide new information on other csDMARDs. Initially, 27 potentially relevant articles were screened. Finally, 10 RCTs were included—four phase II studies and six phase III trials (selection process is shown in online supplementary figure C). Studies’ and patients’ characteristics are detailed in table 2. The meta-analysis showed that tofacitinib was better than the respective control groups in its effect on signs and symptoms and physical function at 12, 24 and 52 weeks. As an example, the pooled OR (95% CI) for ACR20 response at 24 weeks versus placebo was 2.44 (1.97 to 3.02) (figure 1 and online supplementary material). Efficacy of tofacitinib on ACR20 response criteria at 24 weeks. More details are shown in the online supplementary material. This SLR was performed to inform the EULAR task force involved in updating the 2010 recommendations for the management of RA on the efficacy of csDMARDs as monotherapy or combination therapy, with and without GCs in adult patients with RA. Overall, this SLR confirmed the SLRs performed in 20092–4 and expanded the overall insights. Although the place of GC therapy in early RA is still a matter of debate, previous studies have clearly shown the benefit of adding GCs to csDMARD monotherapy or combination therapy, whether at low (≤10 mg/day) or higher doses, especially in patients with early RA.38–41 In 2010, we suggested that GCs might be used as ‘bridge therapy’ before slow-acting DMARDs have taken full effect. Several new studies have confirmed these data. Interestingly, the tREACH trial showed that intramuscular and oral GCs are equally effective as bridging treatments16 and thus answered one of the research questions posed in 2010.1 Moreover, accumulating evidence suggests that low-dose treatment is well tolerated and similarly effective, while reducing the risk of side effects associated with higher doses.13 ,42 However, bone loss should be prevented using appropriate strategies.43 Further research is needed, especially into chronotherapy44 and intra-articular GC therapy. It has been difficult to interpret the results of several investigator-initiated pragmatic or effectiveness trials such as TEAR and tREACH and use them to choose the most appropriate treatment strategy. These trials are justified by clear practical clinical questions that go beyond whether a particular treatment is effective or not; however, the trial methodology is often so complicated that the trial performance and reporting may be jeopardised. Examples of these aspects are trials that do not reach their target number of patients (with lack of statistical power as a consequence), trials with high drop-out rates, or with relatively small numbers of patients (‘completers’) in which the primary endpoint has been assessed (with a risk of ‘bias by completion’), trials with an unplanned interim analysis or a change of primary endpoint (with the risk of convenience reporting, or reporting at odds with the definite results) and trials with an a priori superiority design that are reported with spurious non-inferiority conclusions.47 However, these studies explored valuable concepts that are of significant practical importance to rheumatologists and patients. There are some limitations to our analyses; some outcomes from some studies could not be included in this meta-analysis because we needed at least one measure of variability such as SD. Nevertheless, the current SLR informs the Task Force on the evidence that (i) addition of low-dose GC to csDMARD monotherapy or combination therapy increases overall efficacy; (ii) combination of csDMARDs as triple therapy, is efficacious, but MTX monotherapy appears to be similarly efficacious, especially when combined with GCs and employing a treat-to-target approach; (iii) tofacitinib is a clinically, structurally and functionally efficacious agent. The authors thank Michel Viala for his help with the literature search.
. Efficacy of biological disease-modifying antirheumatic drugs—a systematic literature review informing the 2013 update of the EULAR recommendations for the management of rheumatoid arthritis. Ann Rheum Dis 2014;73:516–28.
. Safety of synthetic and biological DMARDs—a systematic literature review informing the 2013 update of the EULAR recommendations for management of rheumatoid arthritis. Ann Rheum Dis 2014;73:529–35.
. Assessing risk of bias in included studies. In: Fellow JPHSSV, Director SGF, éds. Cochrane Handb Syst Rev Interv. John Wiley & Sons, Ltd, 2008:187–241.
. Remission as the main goal of treatment in early rheumatoid arthritis patients: comparative efficacy of four treatment regimens. Ann Rheum Dis 2011;70(Suppl 3):598.
. Low-dose oral prednisone improves clinical and ultrasonographic remission rates in early rheumatoid arthritis: results of a 12-month open-label randomised study. Arthritis Res Ther 2012;14:R112.
. Early disease control by low-dose prednisone comedication may affect the quality of remission in patients with early rheumatoid arthritis. Ann N Y Acad Sci 2010;1193:139–45.
. EULAR evidence-based and consensus-based recommendations on the management of medium to high-dose glucocorticoid therapy in rheumatic diseases. Ann Rheum Dis 2013;72:1905–13.
. Survival, comorbidities and joint damage 11 years after the COBRA combination therapy trial in early rheumatoid arthritis. Ann Rheum Dis 2010;69:807–12.
. Randomized comparison of triple DMARD therapy with methotrexate monotherapy. Ann Rheum Dis 2013;72(Suppl 3):113.
. A randomized comparative effectiveness study of oral triple therapy versus etanercept plus methotrexate in early, aggressive rheumatoid arthritis. 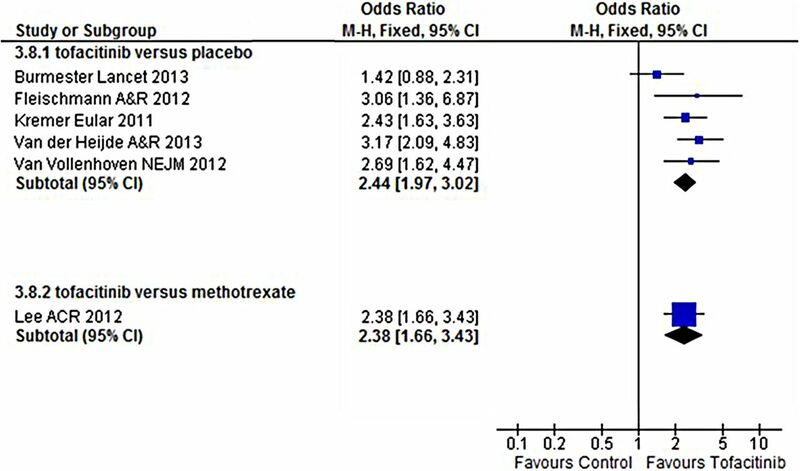 Arthritis Rheum 2012;64:2824–35.
. A randomized, double-blind, parallel, single-site pilot trial to compare two different starting doses of methotrexate in methotrexate-naïve adult patients with rheumatoid arthritis. Clin Ther 2012;34:1195–203.
. Drug-free remission, functioning and radiographic damage after 4 years of response-driven treatment in patients with recent-onset rheumatoid arthritis. Ann Rheum Dis 2009;68:914–21.
. Remission induction therapy with methotrexate and prednisone in patients with early rheumatoid and undifferentiated arthritis (the IMPROVED study). Ann Rheum Dis 2012;71:1472–7.
. Leflunomide or methotrexate? Comparison of clinical efficacy and safety in low socio-economic rheumatoid arthritis patients. Mod Rheumatol 2011;21:375–80.
. A comparative study of the effects of bucillamine and salazosulfapyridine in the treatment of rheumatoid arthritis. Mod Rheumatol 2009;19:384–9.
. The safety and efficacy of a JAK inhibitor in patients with active rheumatoid arthritis: results of a double-blind, placebo-controlled phase IIa trial of three dosage levels of CP-690,550 versus placebo. Arthritis Rheum 2009;60:1895–905.
. Phase II study of tofacitinib (CP-690,550) combined with methotrexate in patients with rheumatoid arthritis and an inadequate response to methotrexate. Arthritis Care Res 2011;63:1150–8.
. Phase IIb dose-ranging study of the oral JAK inhibitor tofacitinib (CP-690,550) or adalimumab monotherapy versus placebo in patients with active rheumatoid arthritis with an inadequate response to disease-modifying antirheumatic drugs. Arthritis Rheum 2012;64:617–29.
. Tofacitinib (CP-690,550) in patients with rheumatoid arthritis receiving methotrexate: twelve-month data from a twenty-four-month phase III randomized radiographic study. Arthritis Rheum 2013;65:559–70.
. Tofacitinib (cp-690,550), an oral JAK inhibitor, in combination with traditional DMARDs: phase 3 study in patients with active rheumatoid arthritis with inadequate response to DMARDs. Ann Rheum Dis 2011;70(Suppl 3):170.
. Radiographic, clinical and functional comparison of tofacitinib monotherapy versus methotrexate in methotrexate-naïve patients with rheumatoid arthritis. Arthritis Rheum 2012;64(Suppl 10):S1049.
. Low-dose prednisone therapy for patients with early active rheumatoid arthritis: clinical efficacy, disease-modifying properties and side effects: a randomized, double-blind, placebo-controlled clinical trial. Ann Intern Med 2002;136:1–12.
. Are changes in bone mineral density different between groups of early rheumatoid arthritis patients treated according to atight control strategy with or without prednisone if osteoporosis prophylaxis is applied? Osteoporos Int 2013;24:1429–36.
. Efficacy of modified-release versus standard prednisone to reduce duration of morning stiffness of the joints in rheumatoid arthritis (CAPRA-1): a double-blind, randomised controlled trial. Lancet 2008;371:205–14.
. Methodological aspects and the interpretation of clinical trial data: lessons from the TEAR trial. Rheumatology (Oxford) 2013;52:409–10. Contributors All authors contributed and finally approved the current manuscript. Competing interests CG-V—consultation and/or speaking engagements: Abbvie, BMS, MSD, Pfizer, Roche-Chugai, UCB; research funding: Expanscience, Nordic Pharma, Pfizer. JN—consultation and/or speaking engagements: UCB. SR—consultation and/or speaking engagements: Fundação para a Ciência e Tecnologia. RL—consultation and/or speaking engagements: Abbott/AbbVie, Ablynx, Amgen, Astra-Zeneca, Bristol Myers-Squibb, Centocor, Glaxo-Smith-Kline, Merck, Novartis, Pfizer, Roche, Schering-Plough, UCB, Wyeth; research funding: Abbott, Amgen, Centocor, Novartis, Pfizer, Roche, Schering-Plough, UCB, Wyeth. MHB—consultation and/or speaking engagements: Abbott, Bristol Myers-Squibb, Chugai, Pfizer, Roche; research funding: Pfizer. JSS—consultation and/or speaking engagements: Abbott/Abbvie, Amgen, Astra-Zeneka, BMS, Celgene, Glaxo, Infinity, Janssen, Lilly, Medimmune, Menarini, MSD, Novo-Nordsik, Pfizer, Roche, Samsung, Sandoz, Sanofi-Aventis, UCB, Vertex; research funding: Abbott, BMS, MSD, Pfizer, Roche, UCB. LG—consultation and/or speaking engagements: Abbott, BMS, Chugai, Pfizer, Roche, UCB.